At Lion Animal Hospital we offer the best medical advice and treatment. We also have an online reservation system (in Japanese). Use the 「時間予約」 button to make a reservation, anytime! Welcome to Lion Animal Hospital! At Lion Animal Hospital we not only offer the best medical advice and treatment, we also want to help you and your family have even more fun with your pet. Just as with people, every pet is unique. We believe that by taking the time to understand and make a connection with your pet, we can better diagnose any problems. This lets us treat the cause of the problem, rather than just the symptoms. In addition to illnesses, you may experience small problems with your pet, or see unusual behavior. We want to provide first-class advice on all aspects of caring for your pet, so you can enjoy spending time with your pet even more than you do now. Please come and talk with us, in Japanese or English! Introduction I’m from Hyōgo Prefecture. After graduating from the Veterinary Medicine Department (Japanese) of Tottori University, I began working at the Central Animal Hospital (Japanese). With their support I went to the Colorado University College of Veterinary Medicine in the USA for further training. I speak English fluently—just ask for me at reception. Exit from the north side of JR Settsu-Motoyama station. Go straight out of the exit towards the main road (called ‘Yamate Kansen’). Turn right at the main road. Walk along the main road for about 5-6 minutes. You’ll pass a Starbucks café, a Lawson’s convenience store and some apartment buildings on the way to the clinic. After a large parking area, you’ll see Lion Animal Hospital on your right. Please give us a call if you have trouble finding us! Exit from the south side of Hankyu Okamoto station. 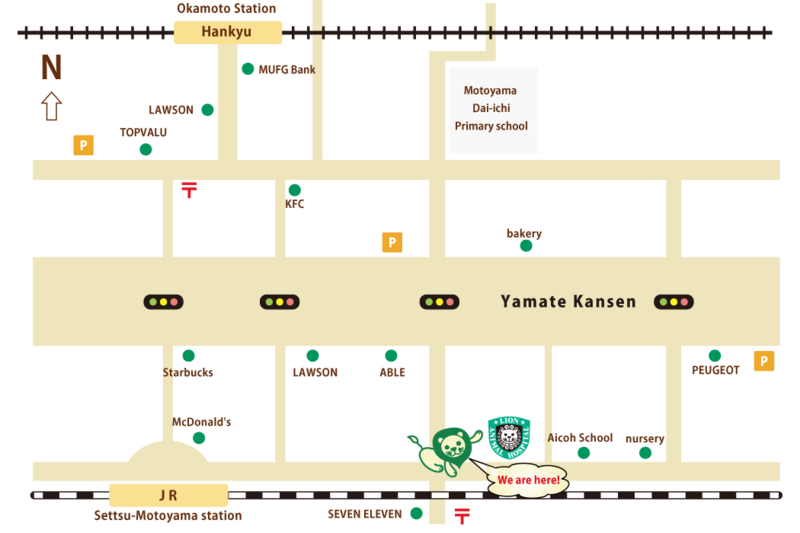 Head south until you reach the main road (called ‘Yamate Kansen’). You’ll see a Starbucks café across the road. Cross the main road so you are on the same side as Starbucks. Turn left and walk along the main road in front of Starbucks. You’ll pass a Lawson’s convenience store and some apartment buildings on the way to the clinic. After a large parking area, you’ll see Lion Animal Hospital on your right. Please give us a call if you have trouble finding us!